(Pkg. 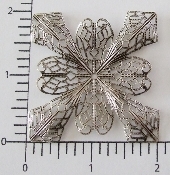 Of 12) 2" Dapped Ornate Sq.Filigree (Matte Silver Ox.) - Accent Factory your home for Wholesale Findings and other Jewelry Parts.